claim, however, is that corporate (or company) forms are fundamentally similar and that, to a surprising degree, jurisdictions pick from among the same handful of legal strategies - although not always the same strategy- to address the three basic agency issues. This book explains in detail how (and why) the principal European jurisdictions, Japan, and the United States sometimes select identical legal strategies to address a given corporate law problem, and sometimes make divergent choices. After an introductory discussion of agency issues and legal strategies, the book addresses the basic governance structure of the corporation, including the powers of the board of directors and the shareholders meeting. It proceeds to creditor protection measures,related-party transactions, and fundamental corporate actions such as mergers and charter amendments. Finally, it concludes with an examination of friendly acquisitions, hostile takeovers, and the regulation of the capital markets. 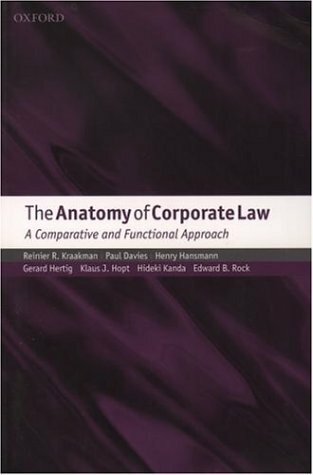 This book should be of great interest to scholars and students ofcorporate and comparative law and to persons interested in business, finance, and economics who wish to deepen their understanding of corporate law.